To create this, I die-cut larger versions of the beautiful leaf from white cardstock. Then I used an ink blending tool and various Distress Inks to color them. Starting on the edges, I applied more and more ink in circular motions until I was satisfied. On some leaves, I used a darker color for the edges. I trimmed a kraft cardstock panel slightly smaller than the red cardbase, inked the edges with Walnut Stain Distress Ink and adhered it to the card. Then I stamped my sentiment onto the largest leaf and adhered the leaves to the card. For more dimension, I used foam tape for the top leaves. Finally, I added some orange sequins. 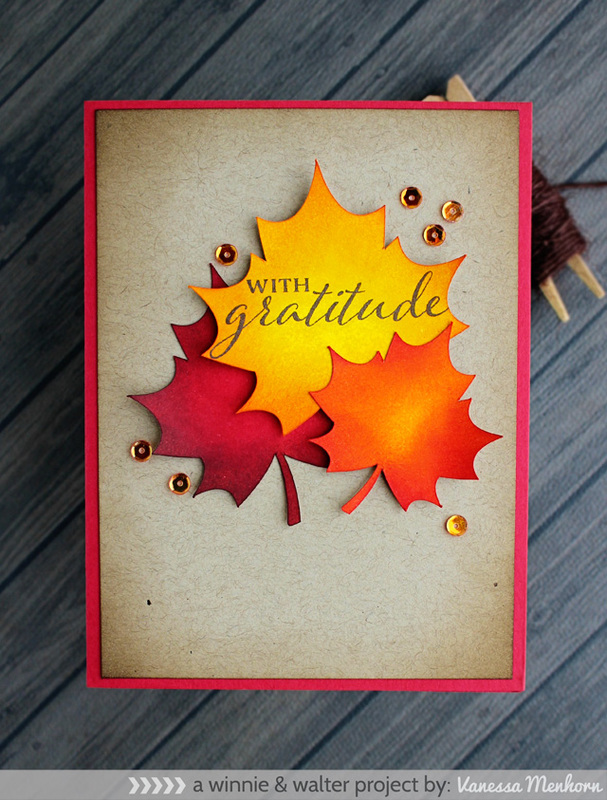 You could make a whole bunch of cards this way, perfect for Thanksgiving! Just die-cut lots of leaves and ink them in various colors and you are almost finished. It is so much fun to create them! Thanks for visiting today, I hope to have inspired you! The inking is just stunning! beautiful!! nice inking on the leaves!! awesome!! Wow those leaves are so vivid and beautiful on that kraft mat...love the addition of sequins. Beautiful card! Great technique! I have to try it! Vanessa's card is gorgeous! W&W 's cut files are an endless source for creativity! Beautiful colours and love that the leaves look so stiff and crunchy! Beautiful card Vanessa and just perfect for the season. I always wonder what to do with my sequins. Now I know. Anything!